CLEVELAND – April 8, 2019 – Everstream, a super-regional network service provider bringing fiber-based Ethernet, internet and data center solutions to businesses throughout the Midwest, announced today the appointment of Sarah Mugford as Chief Marketing Officer. In this newly created role, Mugford will lead the company’s Marketing and Communications team and activities, including overall branding, content, communications, and messaging objectives both internally and externally. 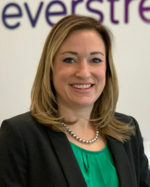 She will serve as a key member of Everstream’s management team, reporting to President and Chief Executive Officer Brett Lindsey. Prior to joining Everstream, Mugford spent 14 years with Charter Communications (formerly Time Warner Cable). Most recently, she served as Vice President, Content and Lead Generation Marketing, where she was responsible for the strategy and execution of Spectrum Enterprise client acquisition campaigns. In this role, she led a marketing team which closely collaborated with enterprise sales teams to positively impact revenue production across all market segments. During her tenure with Charter, Mugford served in a series of marketing leadership roles, each with increasing responsibility and oversight. Her broad range of experience includes enterprise lead generation, client experience as well as digital, product, content and vertical marketing. Serving as a change agent to the organization, she drove marketing transformation through modern marketing strategies and integrated, data-driven digital campaigns.